What makes a home, office or building beautiful is its finishes. Stainless steel with all its benefits is one of the best ways to add the final touch. The unique aesthetic qualities of stainless steel offer endless possibilities and make it one of the construction industries trump cards. It is tough, durable, hygienic, adaptable and recyclable. It is also modern and at the same time long lasting. Nothing withstands the test of time quite like stainless steel. With regular maintenance anything made of stainless steel will have a long life. It is easily cleaned using standard cleaning agents and suffers no deterioration from the effects of these agents. Stainless steel is affordable and combined with its superior durability it is one of the most reasonable options in terms of overall cost. Duratrendis a dynamic company that offer a full design, manufacture and installation service of stainless steel balustrades, handrails, staircases and other stainless steel products. 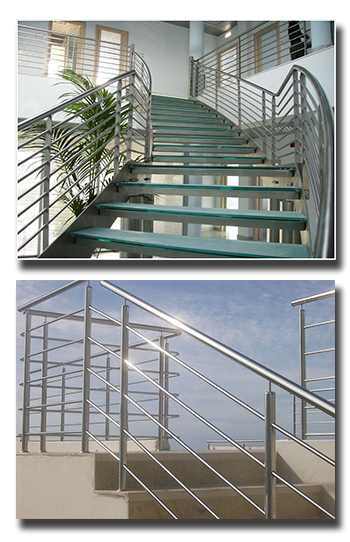 We are specialists in balustrade designs in different ranges of stainless steel and aluminium, glass and wood for balconies, staircases, spiral staircases, hand rails and more. Our reputation is built on a professional, reliable, and tailor-made service to our clients that include architects, builders, developers, interior designers and the general public. Our efficient service include a site meeting with the client, taking measurements and discussing in length the clients requirement and expectations of the project. We perform jobs of any size for renovations and new buildings that include offices, homes, restaurants, shopping centres, retails outlets, hospitals and more. No job is too big or too small and we pride ourselves in offering our customers tailor-made solutions to suit their every requirement. Playing with all the possibilities of colour, finish and shape, we give free rein to our imagination in the design, manufacture and installation of stainless steel products that are long lasting, affordable, aesthetically pleasing and blend perfectly with the surroundings.